We’ve all been there, putting off a task until the very last minute (probably more often than we’d like to admit). We try to convince ourselves that we work best under pressure and that we’re “just waiting for the right time." Sound familiar? Those excuses might work occasionally, but the truth is we’re procrastinators — and procrastination is a bad habit. So to avoid stress and sub-par work, here are five ways to choose productivity instead. The 2-minute rule is simple: Immediately do any task that can be completed in under 2 minutes. You’ll get small tasks taken care of fast and make sure they don’t slip your mind later. And completing small tasks throughout the day can also provide a sense of accomplishment — perfect for getting over a procrastination slump. In a popular quote by Mark Twain, he says that if you have to eat a live frog first thing in the morning, you can go throughout your day knowing the worst is behind you. Well in this case, your frog is your most important task, probably the one you’re putting off right this minute. But take a cue from Mark, start your day off right, and get it done. Keep your to-do list realistic. Lots of people think the best way to stop procrastinating is to make a to-do list. While they’re great at helping you see everything in one place, filling up your plate with too much too fast can leave you feeling overwhelmed — and put you right back where you started. When creating to-do lists, focus on the most important things that need to get done first and then go from there. If you’ve got a lot on your plate, the best thing to do is to start scheduling. Create a reasonable timeline that doesn’t throw everything at you in one day. Schedule your most important tasks first and commit to a deadline. Remember to schedule some breaks too so you don’t get burnt out. Accept that the perfect moment doesn’t exist. Don’t let this common excuse get in your way. If there’s a task you’re dreading, there will never be a perfect time to do it, so it’s best to just eat the dang frog. Make the most of the motivation you have and go from there. Don’t worry, it’s usually never as bad as you think it’ll be. 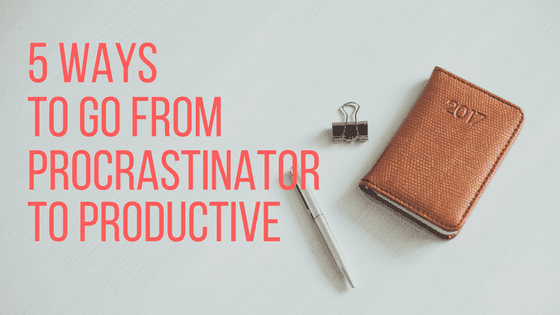 Calling all procrastinators: Do you have a tip we forgot about? Share your favorite with us on Twitter @moproteam. And then get back to work.